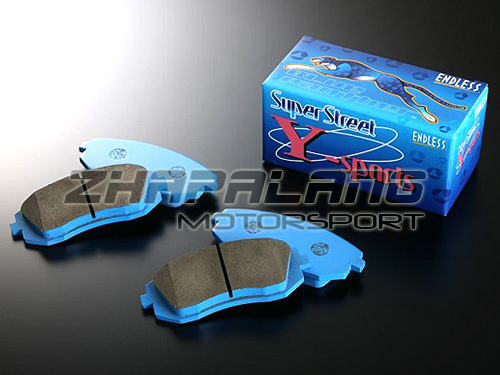 Endless Super Street Sports-Y pads set the initial grip at a higher performance level. Mu, the coefficient of friction, changes with temperature so the engineers designed this compound to react quickly at low temperatures while still having the ability to fend off fade and recover quickly. The Super Street Sports Y compound pad allows you to take advantage of its high performance without leg-press force on the brake pedal. Developed for lots of repeated braking, this compound uses a special resin material creating a soft compound that is strong and resistant against high temperatures. Endless also recommends that this pad be used for closed-course drag race situations. Endless have researched the correct rotor temperature ranges for the spirited street driver. The rotor temperature range for this compound is wide and mu-level is consistently stable. Thus, brake pedal force does not change considerably at different rotor temperature ranges and braking performance levels maintain consistency on the street given most situations. This is a very controllable compound that is set at a high mu-level. After fade, recovery is achieved while brake performance does not worsen, returning to the mu-levels achieved before fade, right away. Part of the Non-Steel Series, Endless uses a Non-Steel Developmental Process using a new, mild ceramic material to increase rotor friendliness. With no steel materials, dust is minimal and rusting is prevented, enabling ease of cleaning wheels (even with water).